Dirt and mud that covers your 4 wheeler after a long day of off-road fun can easily be sprayed off with water. The real damage is what happens to your quad while you store and transport it. See the images above for your SOLUTION to protecting your ATV from nature’s harm! RAIN OR SHINE, NOT A PROBLEM - Don’t be that guy riding around on a faded or moldy quad. Cover your baby when not in use to maintain that fresh paint job and prolong the life of your engine! HASSLE FREE EXPERIENCE - Our covers include an elastic base to make it easy to cover and uncover your off road vehicle. Made to grip around tires, you will never struggle with this falling off or coming loose! 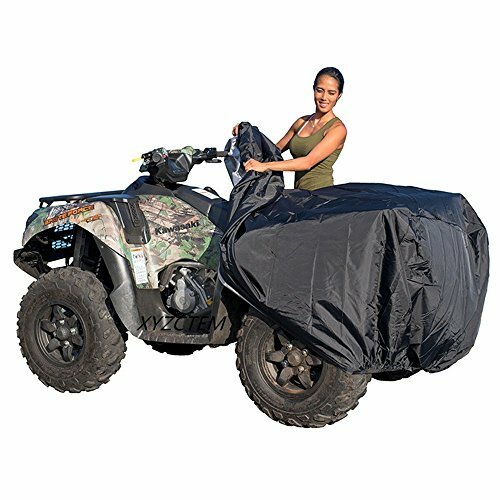 ONE SIZE FITS MOST - 100” x 43” x 47” fits most Honda, Yamaha, Polaris, Suzuki, Kawasaki,Such as Suzuki 400 eiger,Honda foreman,Honda rancher,Polaris Sportsman,Polaris Sportsman 570,Trailerable,Rhino, Drawstring,Quad gear,with Windshield, Can-Am and Arctic Cat models of ATVs! Includes a FREE storage bag to carry your cover when you are out on your adventures!